The White Lake Sailing School holds the enviable position of being the oldest Sailing School with a continuous uninterrupted record of service, and having used a written text since its inception. For young and old alike, the programs we offer are taught by certified instructors that have always been chosen from the ranks of its graduates. Entirely self supporting, without club subsidies, it has taught sailing to three generations. White Lake Sailing School is located on the south shore of White Lake in Western Michigan. Founded in 1926, WLSS has been proudly serving the White Lake area for over 86 years. 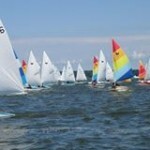 WLSS is open to the public and we offer a wide variety of sailing programs designed for all ages and experience levels. Come learn how to catch the wind with us and be able to enjoy a lifelong water sport! The WLSS is a not-for-profit 501(c)(3) corporation and our programs are all open to the public. You will find all information regarding WLSS, scheduling, program descriptions, level skills, registration and more on our updated web site at www.wlsailingschool.com. We so look forward to seeing all of our returning sailors and families this season and welcome the new!